The Self-Study is both retrospective and forward-looking and allows CEU to explore and demonstrate the fulfillment of the MSCHE Standards for Accreditation and the Requirements of Affiliation warranting re-accreditation by the Middle States Commission on Higher Education. 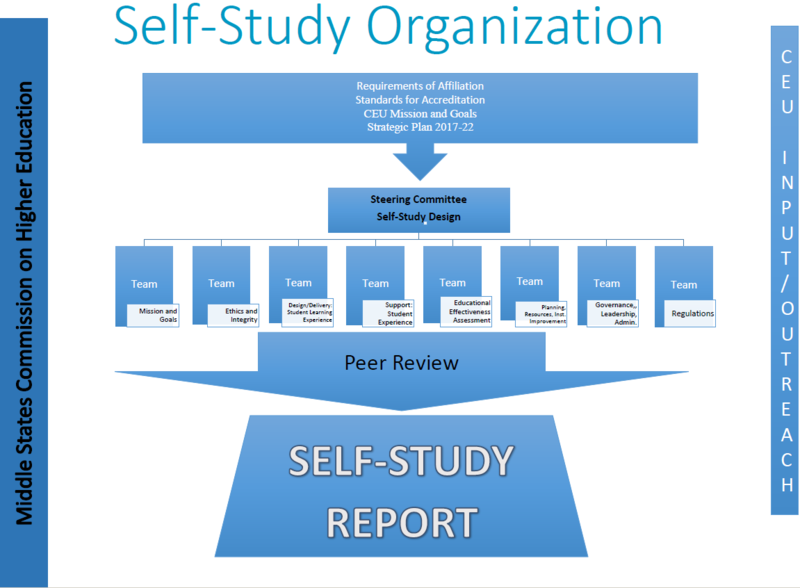 A Self-Study Steering Committee (launched in AY 2016-2017) comprised of two co-chairs and 12 additional members met regularly during this period to steer the implementation of the Self-Study Design. The Self-Study Design includes the organization of the study and methodology as follows. In alignment with the Standards for Accreditation, seven teams co-chaired by Steering Committee members were convened through a careful selection process (involving presidential nomination and Senate confirmation) to maximize wide, diverse, and cross-cutting engagement of the CEU community. Each team included approximately 7-11 members totaling 82 faculty, staff and students core research members that were guided by charges outlined in the Design. In practice, the study ultimately involved the additional participation of hundreds of people from across the CEU community including members of the Academic Forum and Senate, the Senior Leadership Team, Heads of Departments, Student Government representatives, senior administrators, staff units (esp. IRO and Careers Office), program coordinators, and various participating students, staff and faculty through focus groups, interviews and a survey. 1) Is CEU achieving its goals and objectives, especially as they relate to CEU’s institutional mission and related strategic priorities? 2) What should CEU do to improve its effectiveness in achieving its fundamental aims as aligned with the MSCHE Standards for Accreditation and Requirements of Affiliation? Administrative units (e.g. Entry/Exit Surveys, Alumni Surveys, Career Services placement data, Course and Teacher and Supervision Evaluations, Intellectual Themes Initiative reports, Global Teaching Fellowship reports, administrative unit reviews, Student Union documentation, Recruitment and Enrollment reports, Campus and IT strategies, Development and ACRO reports, CEU’s budget, etc.). Departments and other academic units (e.g. Annual and Strategic reports, syllabi, theses grading criteria, curriculum maps, etc.). Registry of CEU Official Documents (e.g. policies and guidelines, and Academic Forum, Senate and Committee meeting notes and reports). * CEU’s website, e-learning site, social media platforms (e.g. https://www.ceu.edu; https://ceulearning.ceu.edu). Self-Study teamwork primary data (e.g. 2018 Self-Study Survey, focus groups, interviews, case studies, and archival research). For more information on the organization, aims and methodology of the Self-Study, click here to download a copy of the Self-Study Design.